DEVELOPERS of Mono might wish to rethink their vocation. While statistics and surveys indicate that Mono’s share is minuscule, things are getting worse not just for .NET but for Silver Lie too (and Moonlight). Microsoft only hypes that up at the moment due to an imminent new release. Livnat Peer says that Qumranet (now part of Red Hat) is working to replace C# with Java and she explains how to achieve this. In 2008 RedHat acquired Qumranet, a startup whose focus was Virtualization. Among other products Qumranet developed a management application for Virtualization. We started exploring the web looking for ideas how to approach this task. At the beginning things did not look promising most of the references we found for porting projects from one technology to another were about complete failures, the only obvious suggestion that we saw all over was not to change technology and architecture at the same time. In addition to the ongoing effort with Tangible we had to dumb down the C# code. For example we had to remove the usage of the Linq library in the C# side since it is not converted to Java properly. And in the same time we wrote some “sed” scripts to manipulate the Java output and fix some errors like packaging, adding import statements at the beginning of the class or adding a static data member (logger) in each class. Red Hat/Fedora are distancing themselves from Mono and it shows. The Source indicates again that Apple will block MonoTouch, despite Novell's announcement from last week/month (maybe a clarification will be made at a later date). If Flash/.NET/Whatever dominates Apple development, then Apple is no longer in charge of their own platform. 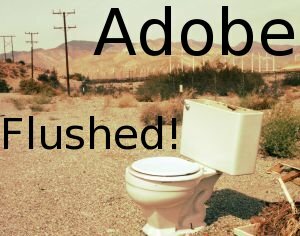 Adobe is. Or Microsoft. Or Whoever. I see the entire situation as “How dare you do to us developers what we are together doing to the users!” Hey, Mr. Developer, you want Freedom? How about developing for a platform that offers Freedom? The Source actually defends Apple when it comes to this decision. Given that Google intends to push for HTML5 video (VP8 or Ogg), who will need Flash anyway? It seems as though Flash is nearly doomed. It was quite irrelevant before Web video became widespread and it may be going back right where it used to be (only to compete with HTML5 and SVG, which is tougher). Lee Brimelow from Adobe was so upset that he publicly wrote “Go screw yourself Apple.” The press was all over this [1, 2, 3]. “Go screw yourself Apple,” wrote Lee Brimelow, an Adobe platform evangelist, on his personal Web site, The Flash Blog. The enemy of thine enemy and all that … but seriously, supporting it? From day one they’ve blocked everything else, and that includes many free platforms, from java to python. That this also affects proprietary offerings shouldn’t be a surprise. The only laudable point here is that it provides yet another extremely clear demonstration that we can all point to of how anti-capitalist proprietary hardware manufacturers are. And also the inherent risk in relying on them to be fair in their closed markets – the only recourse may be the courts and if that happens everyone loses apart from the lawyers. I’ve just learned that Adobe might sue Apple over it.